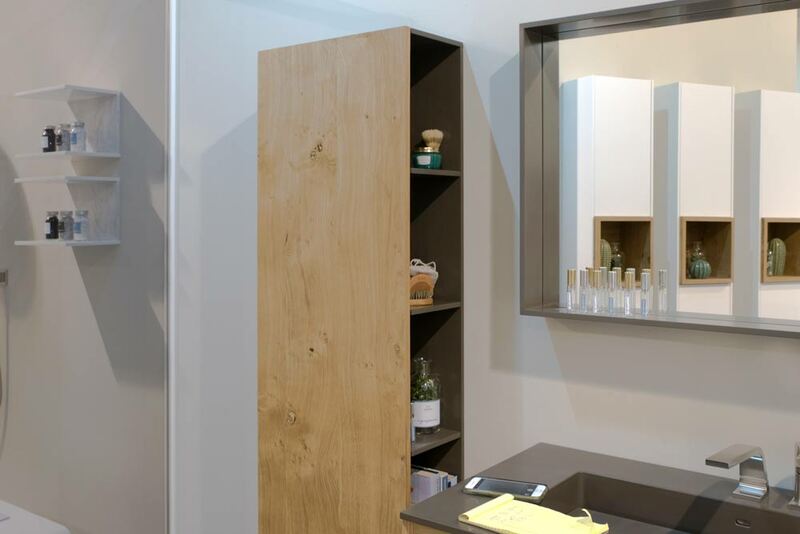 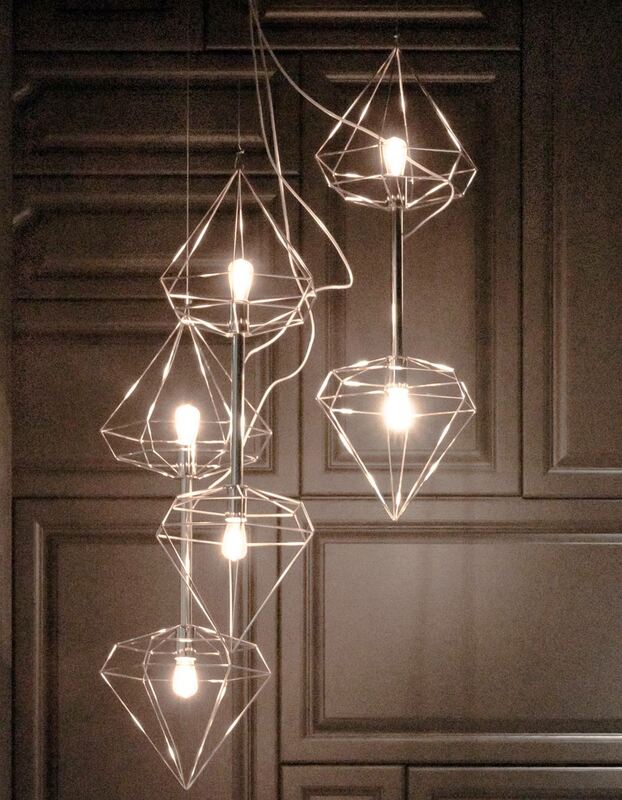 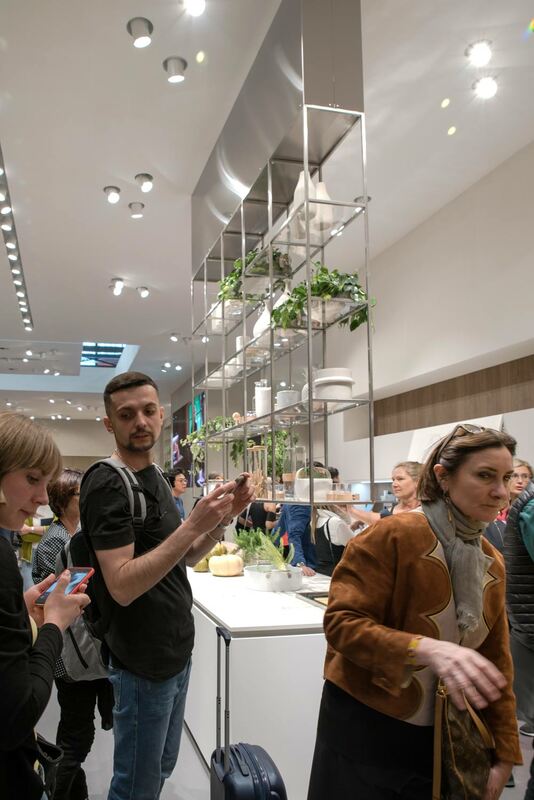 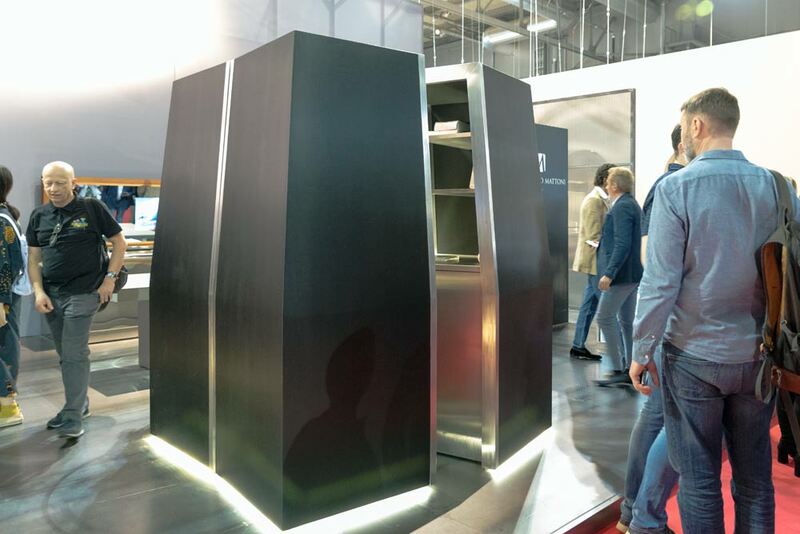 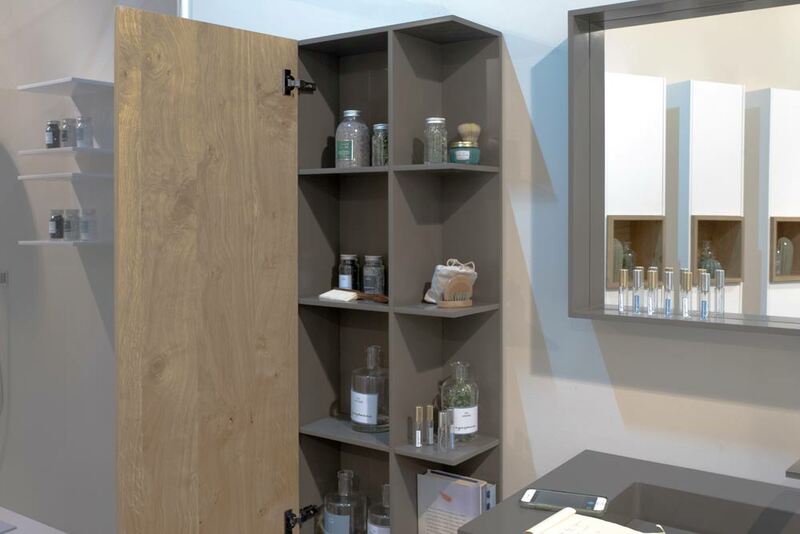 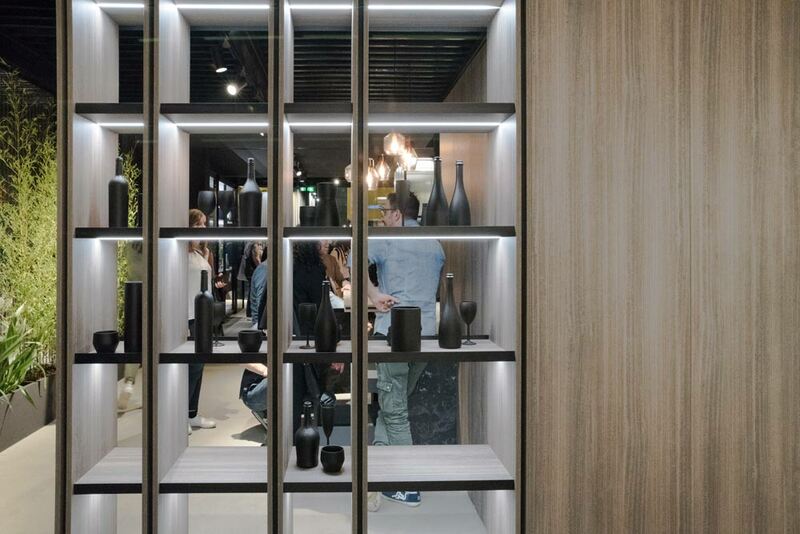 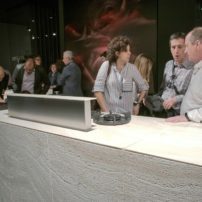 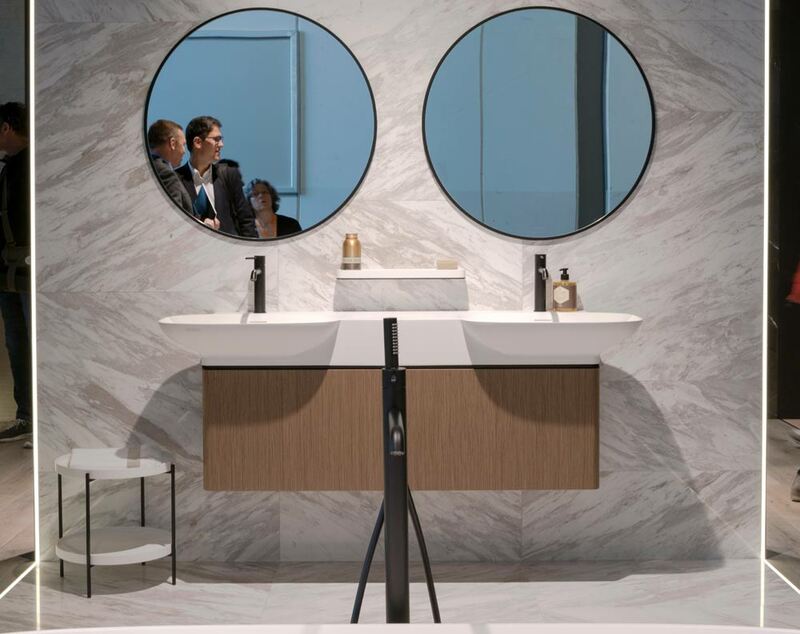 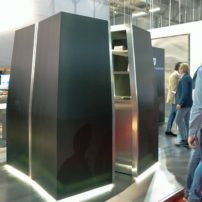 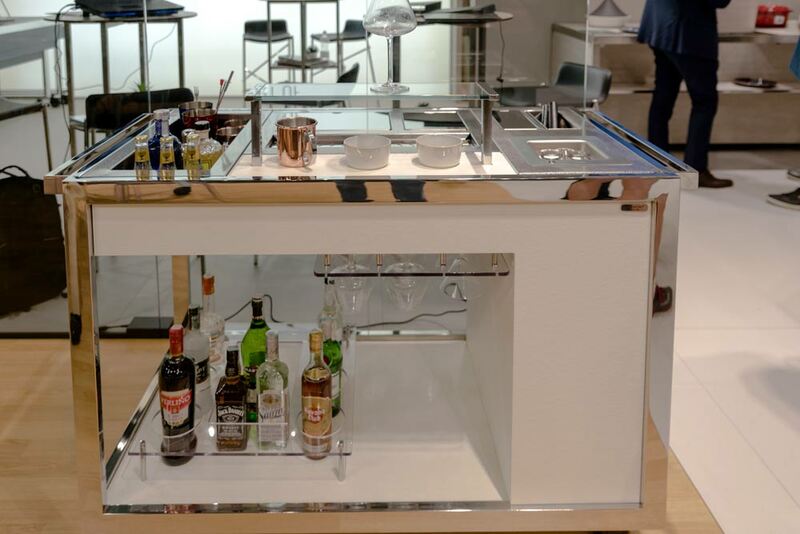 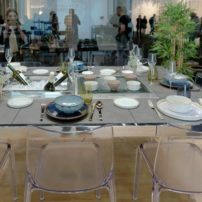 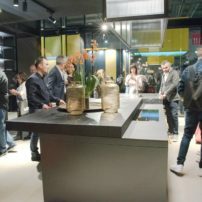 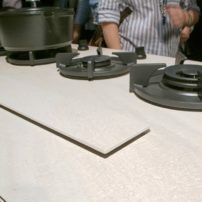 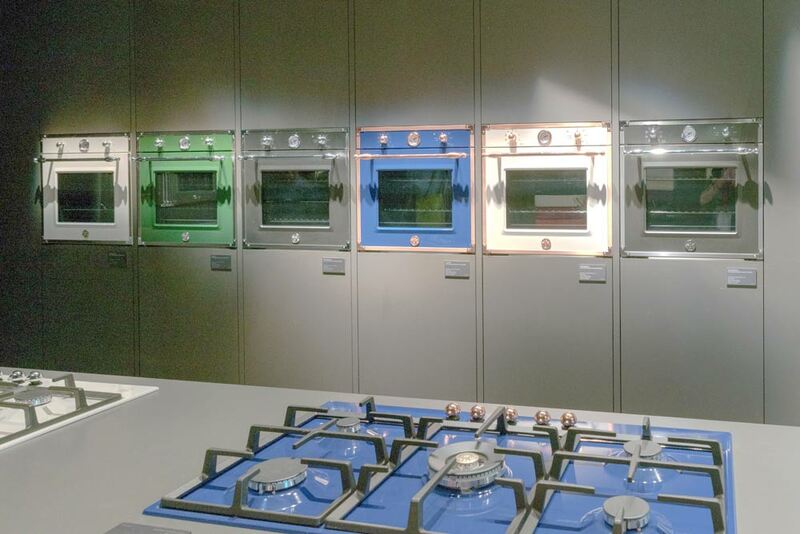 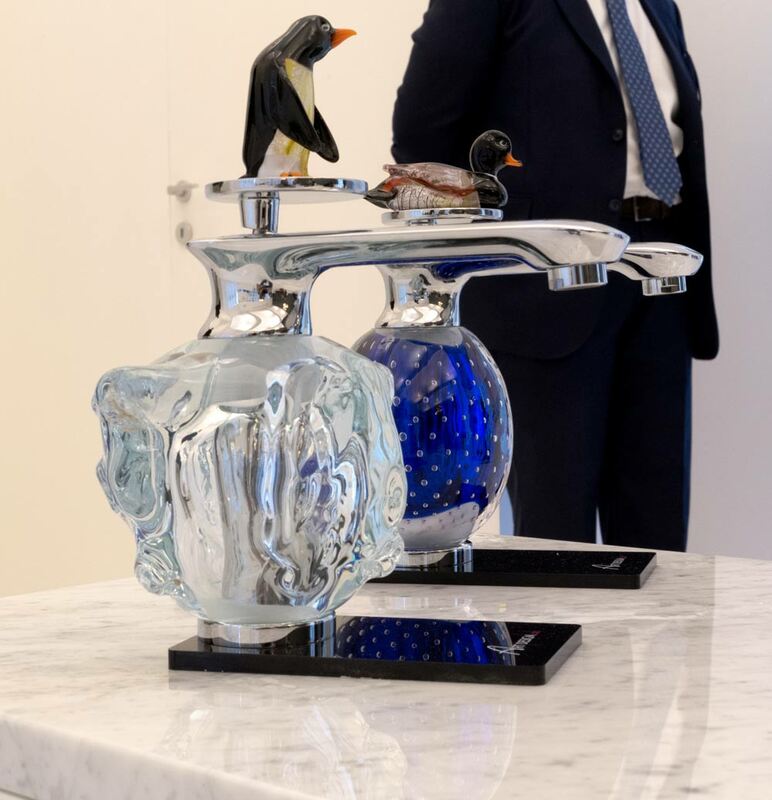 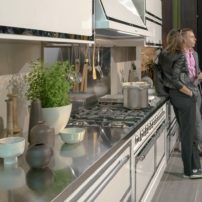 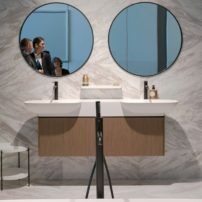 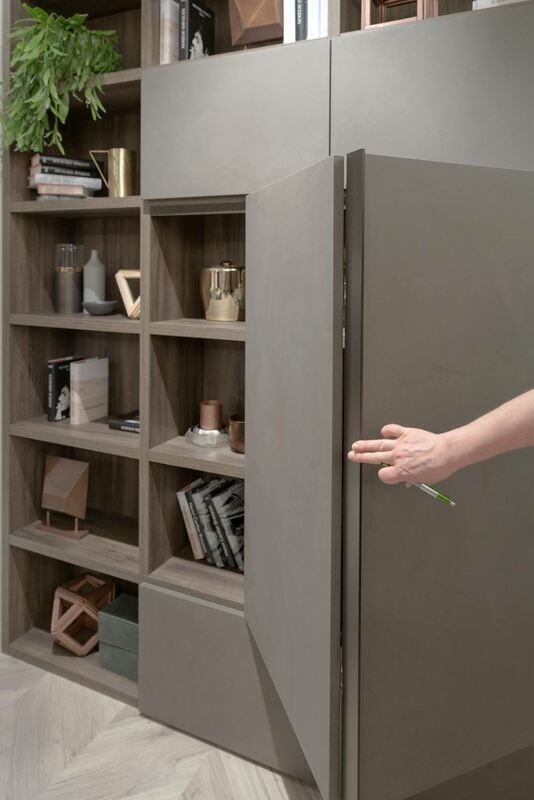 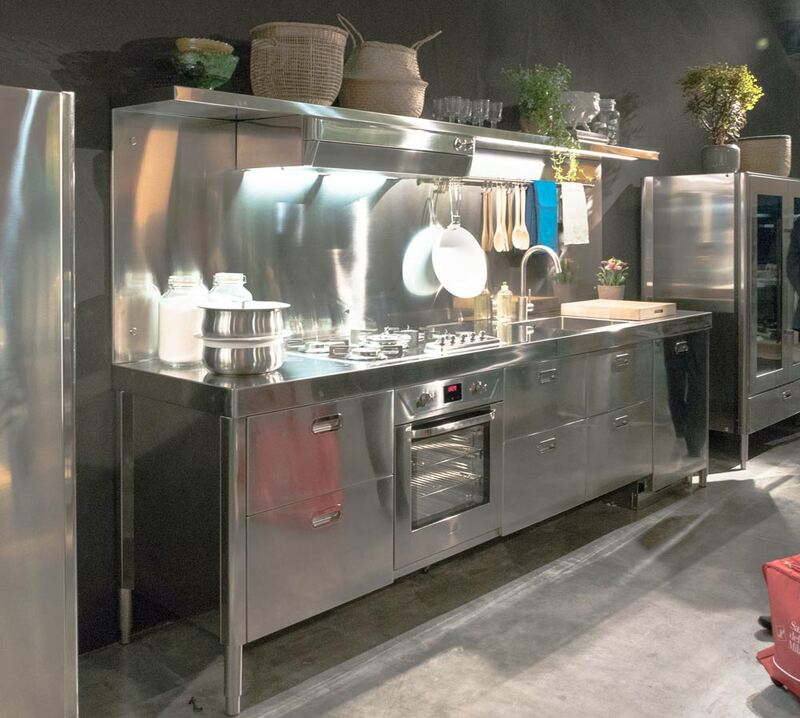 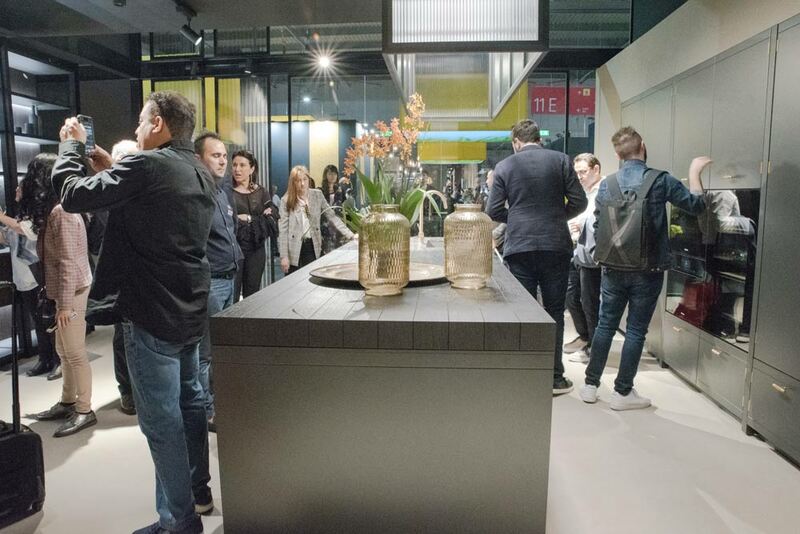 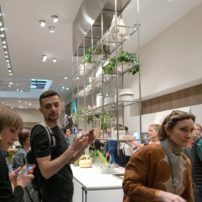 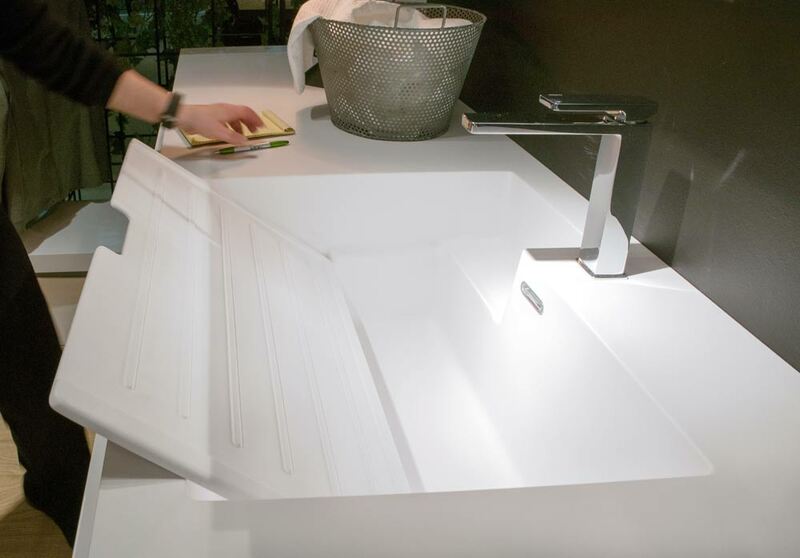 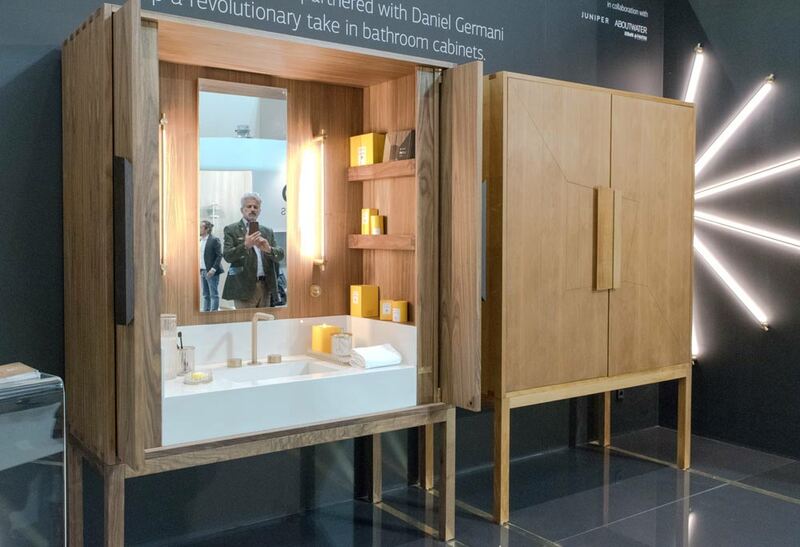 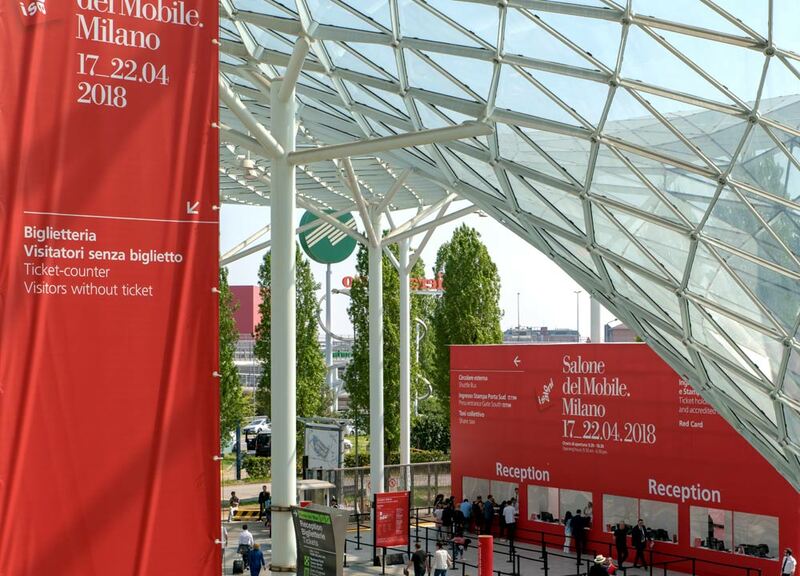 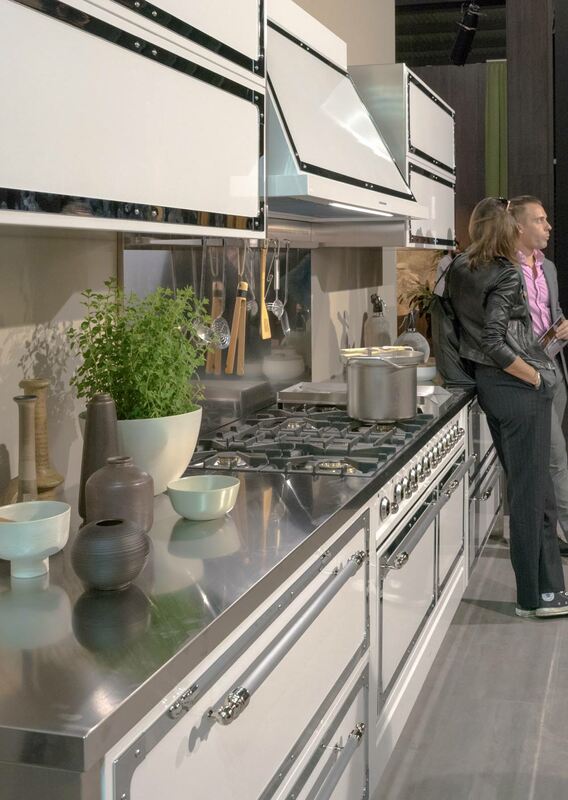 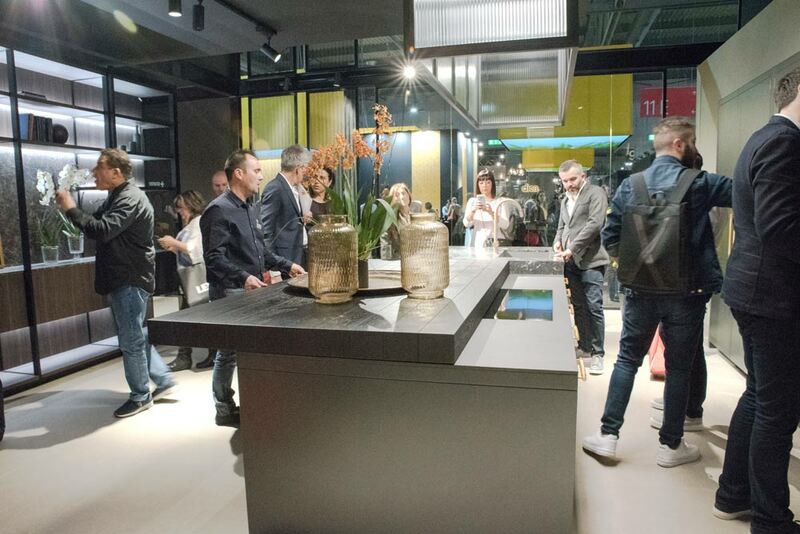 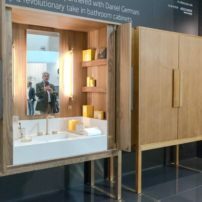 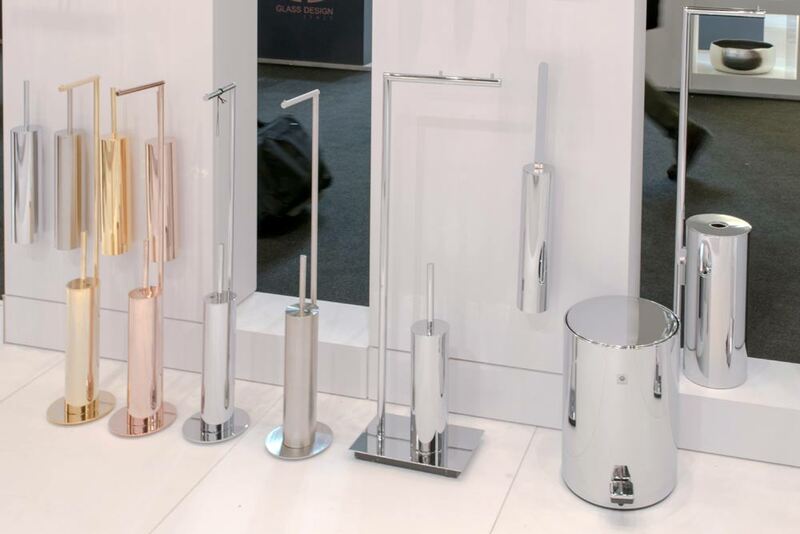 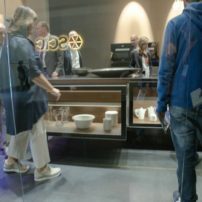 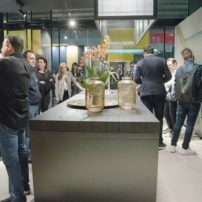 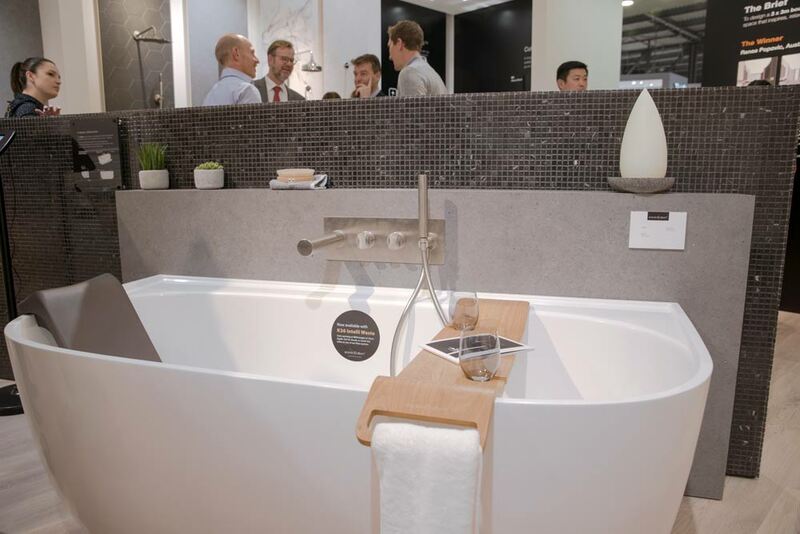 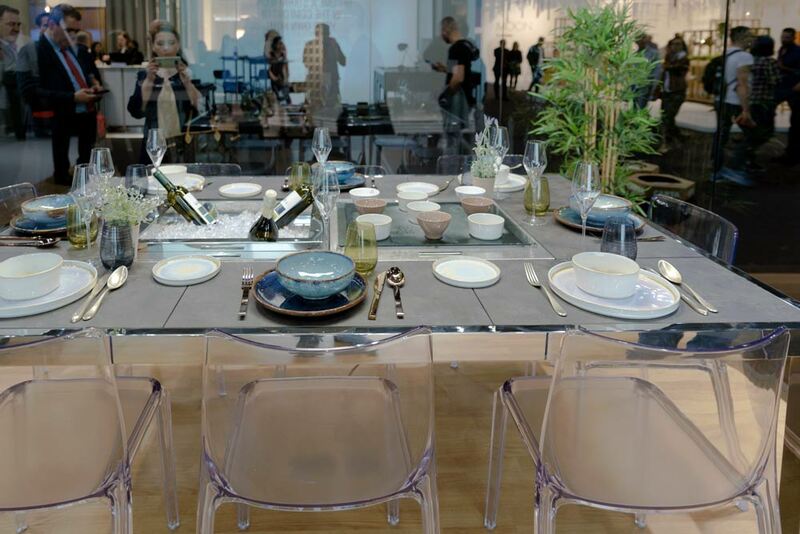 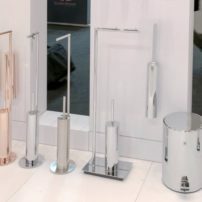 The latest in European kitchen, bath and furnishing accessories design was on display in April on the Salone del Mobile campus in Milan, Italy. 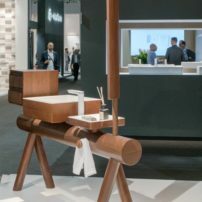 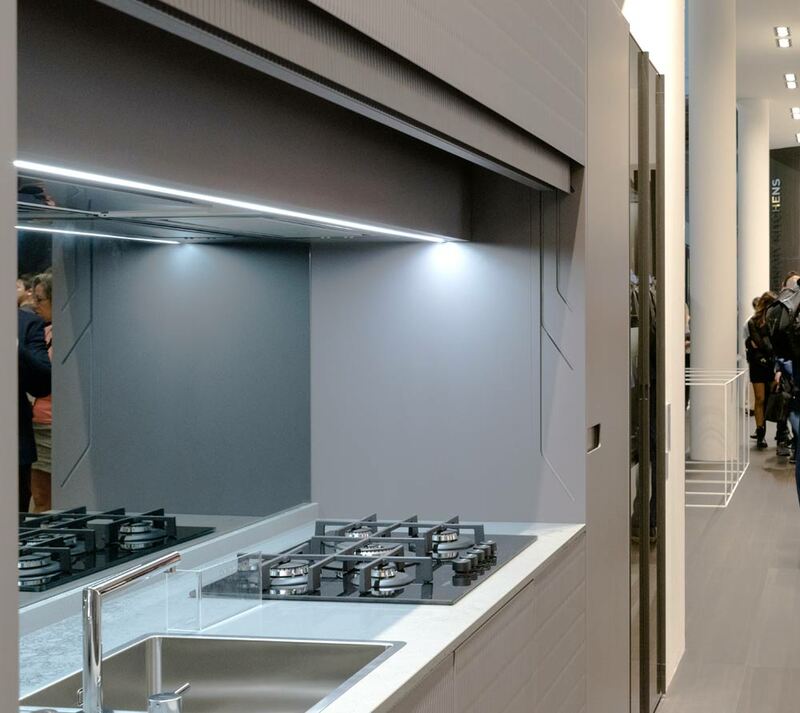 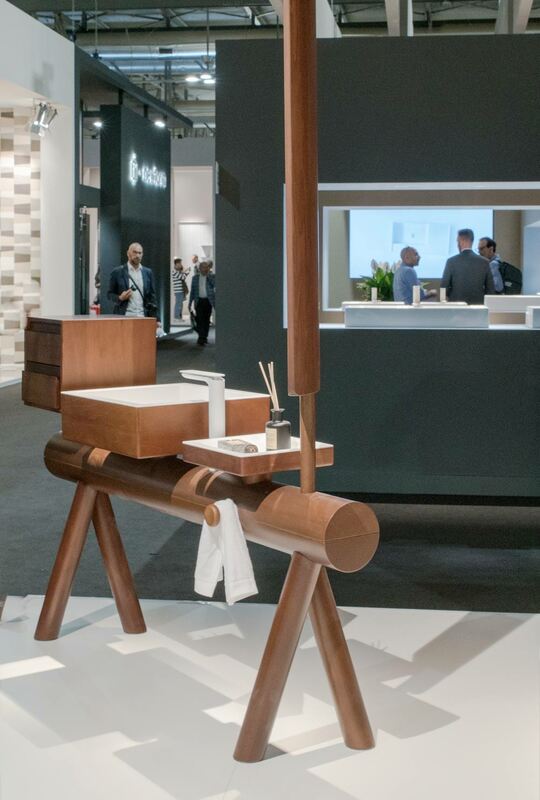 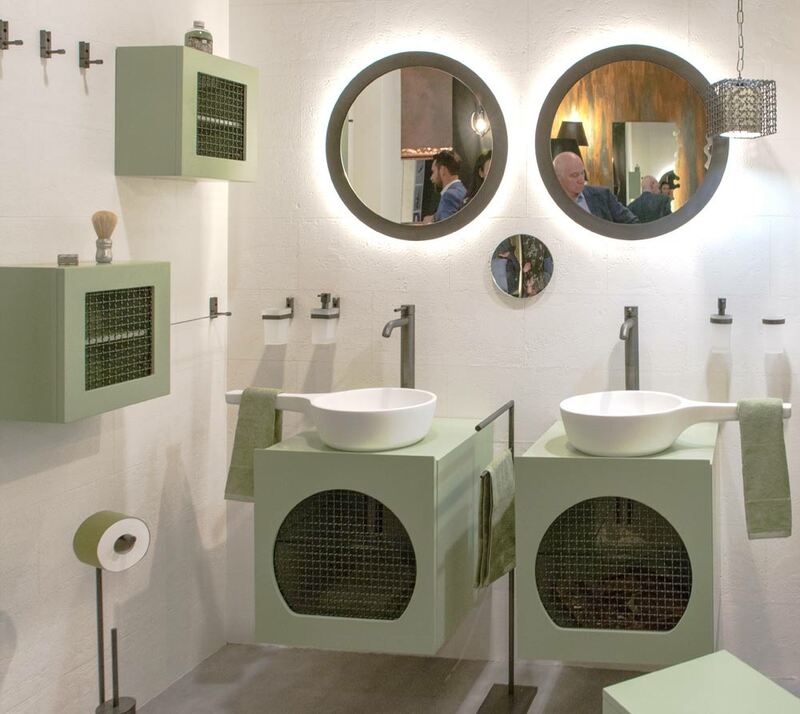 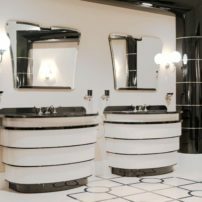 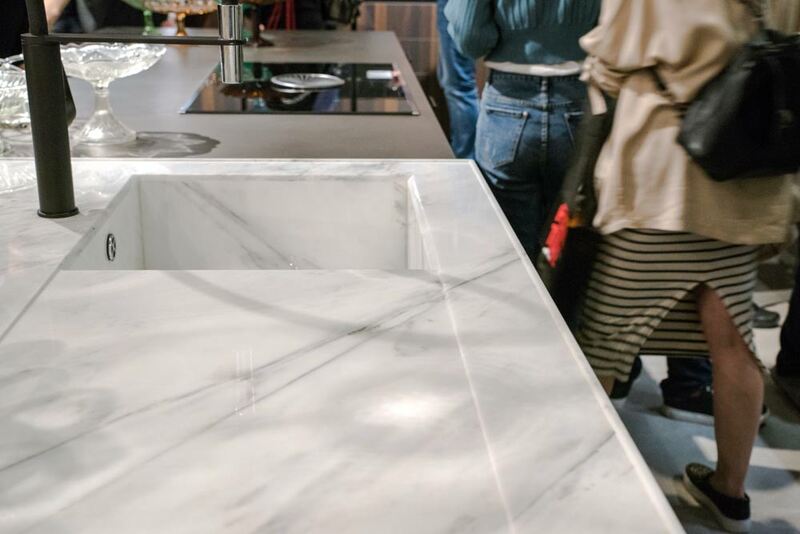 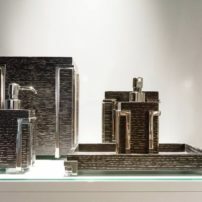 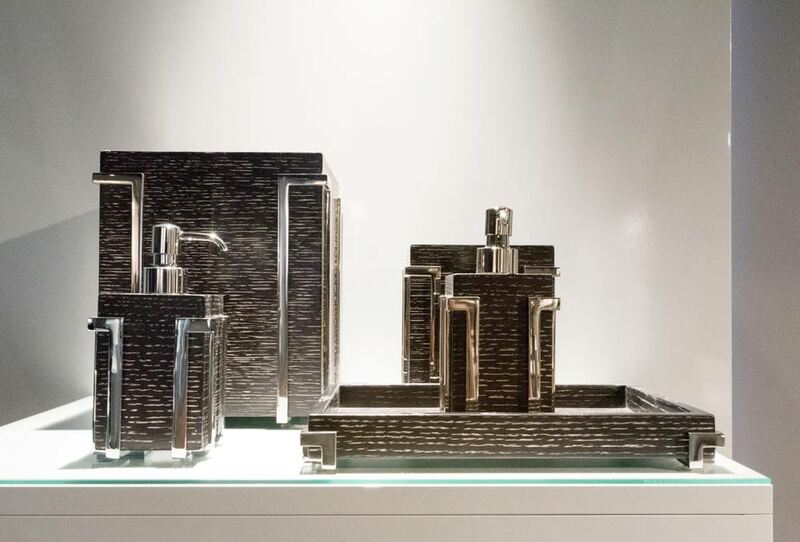 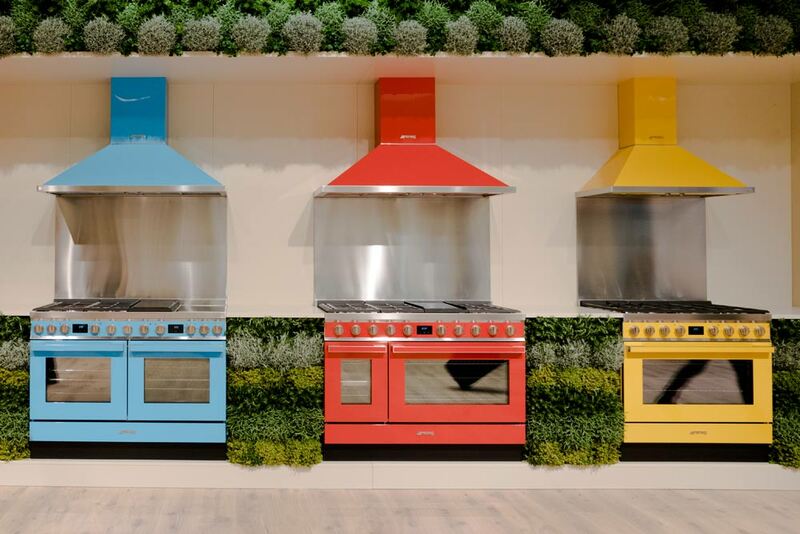 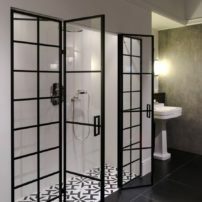 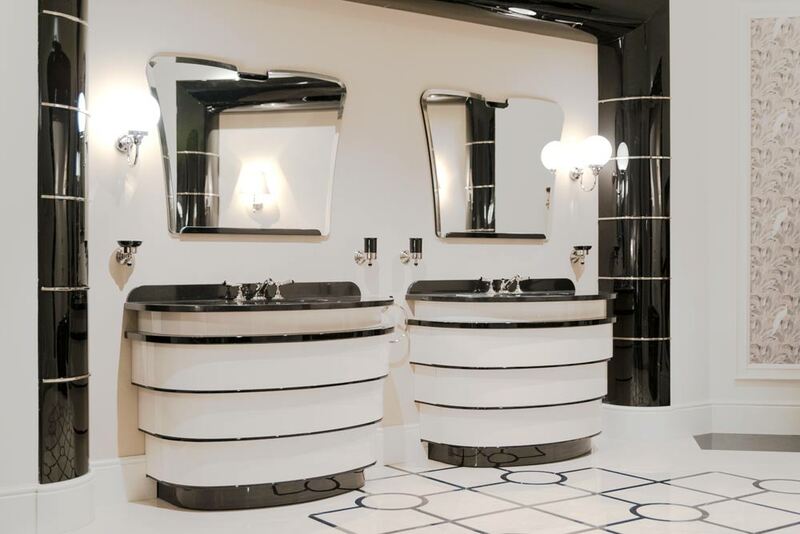 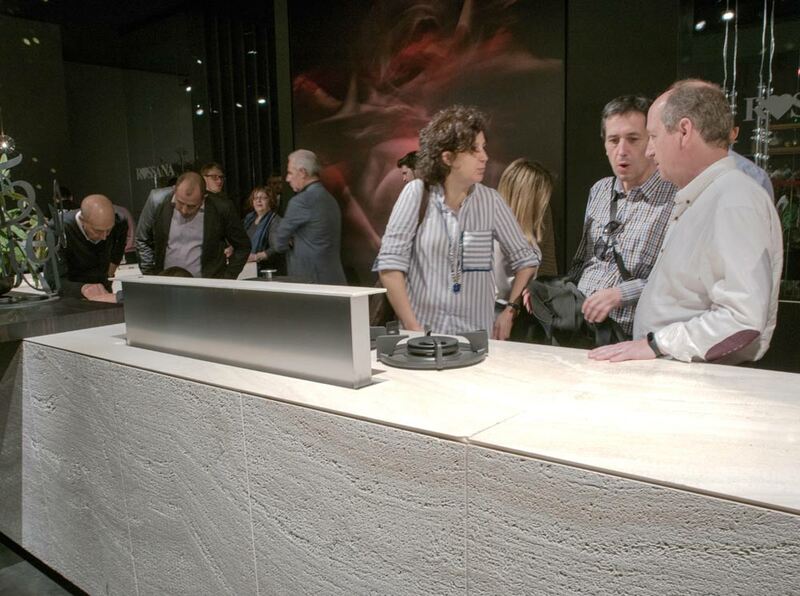 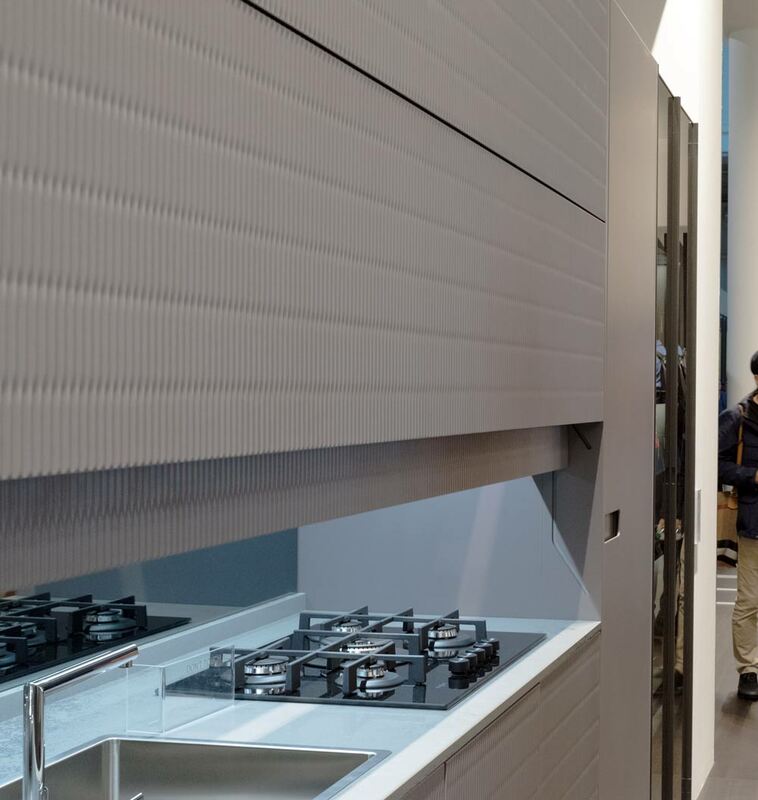 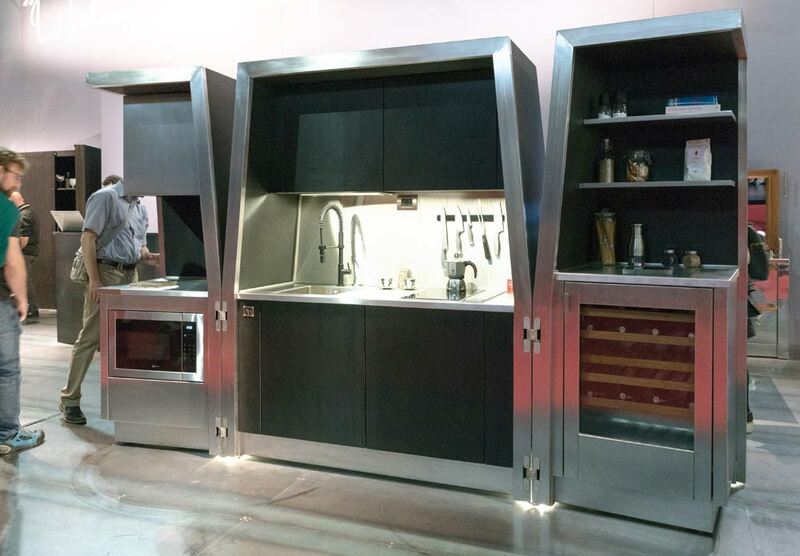 The 57th combined exhibition of EuroCucina, the International Bathroom Exhibition and the International Furnishings Accessories Exhibition included 1,841 exhibitors from 33 countries, occupying just over 591,000 square feet of space. 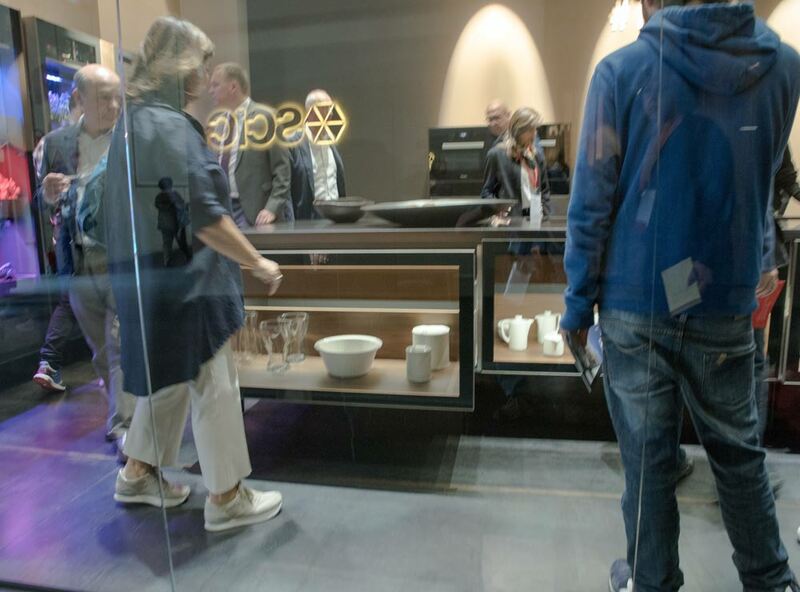 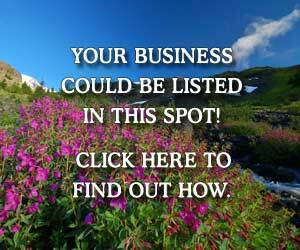 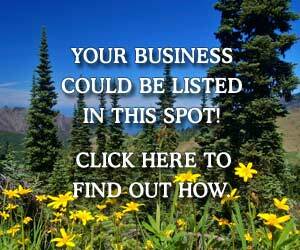 The exhibition attracted nearly 435,000 attendees from more than 165 countries. 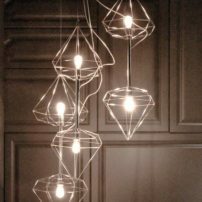 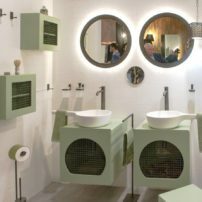 Major themes included vivid colors, incognito storage for every room in the house, sleek and modern yet not sterile design forms, and nature being incorporated into the living environment by using texture and actively bringing the outdoors in. 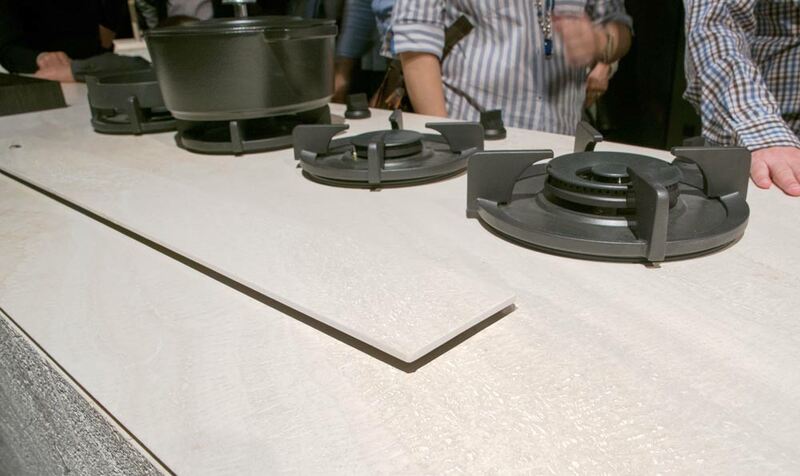 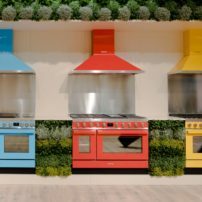 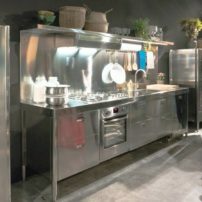 There was nothing drab or monochromatic about EuroCucina. 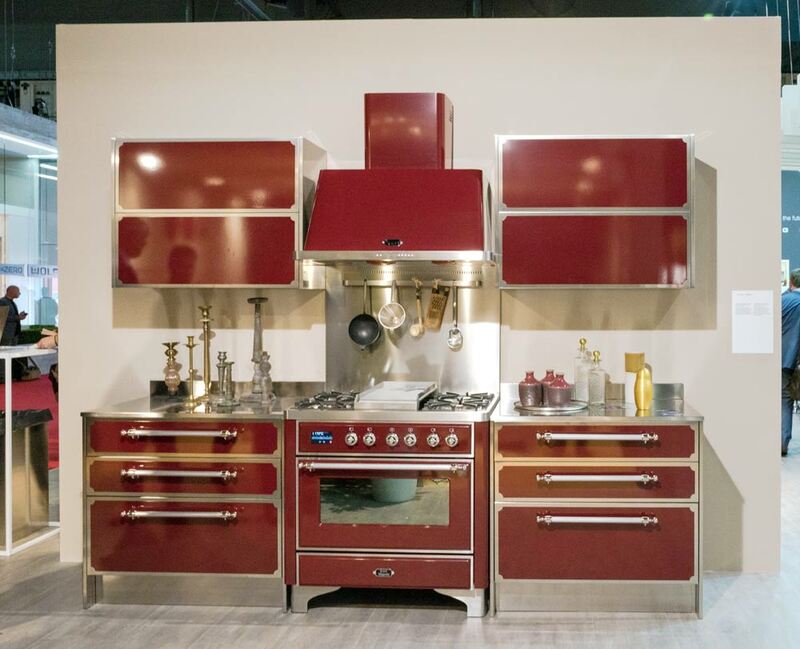 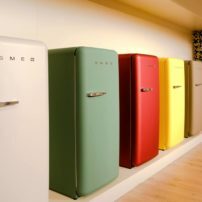 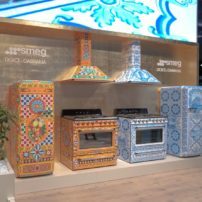 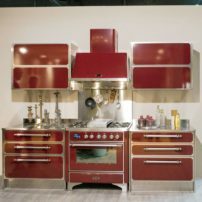 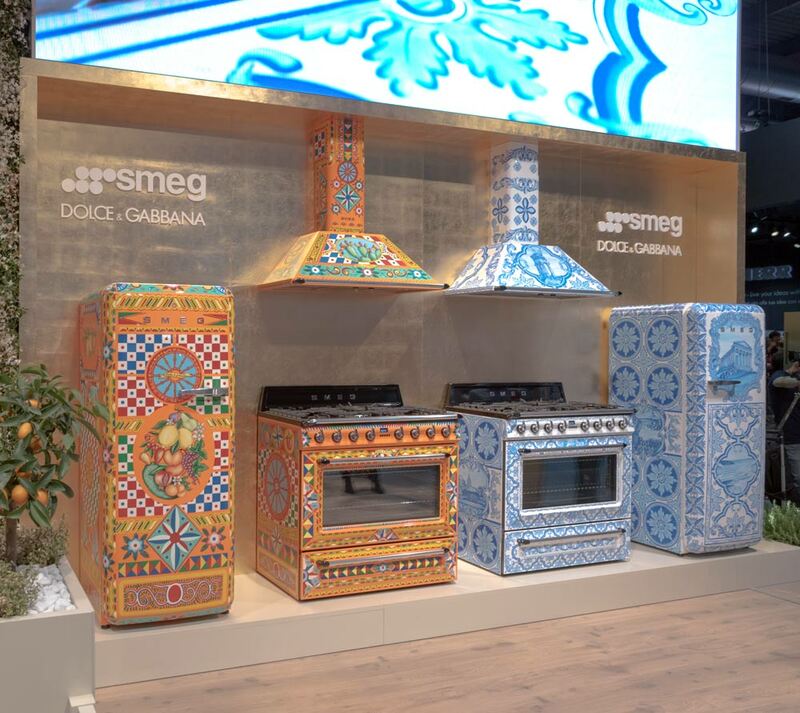 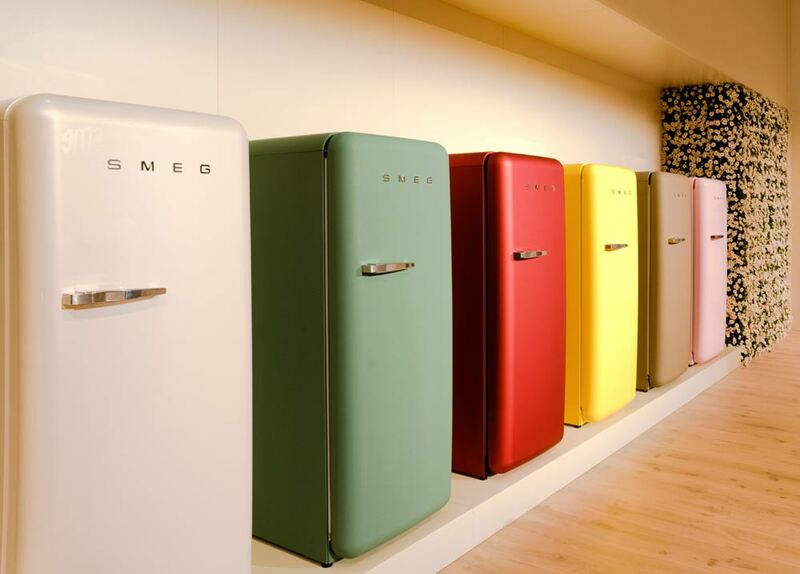 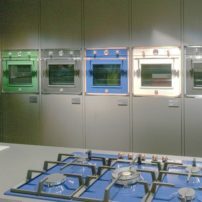 From the brightly finished appliances and plumbing fixtures to cabinetry and countertops, there were numerous products to help you “get your color on,” and nobody did this quite as uniquely as appliance manufacturer Smeg with a wee bit of help from fashion house Dolce & Gabbana. 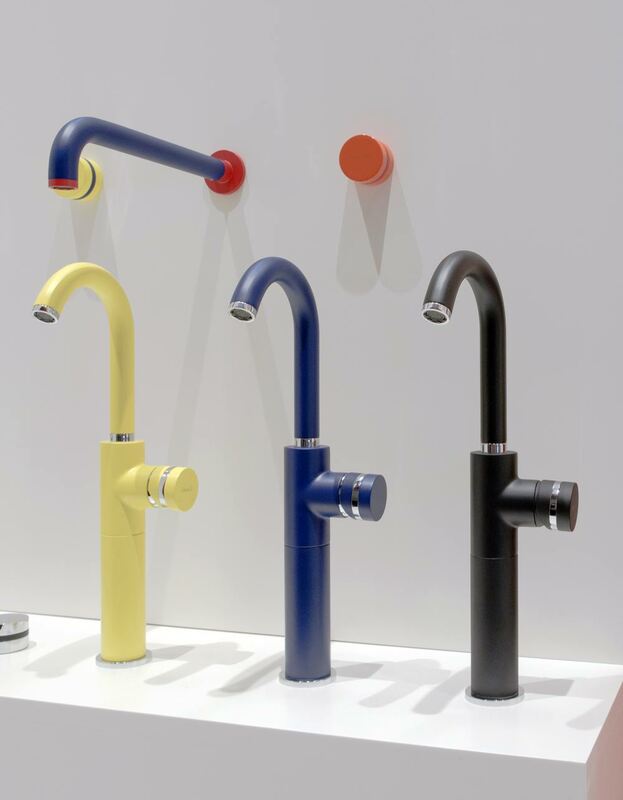 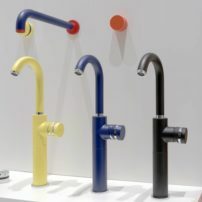 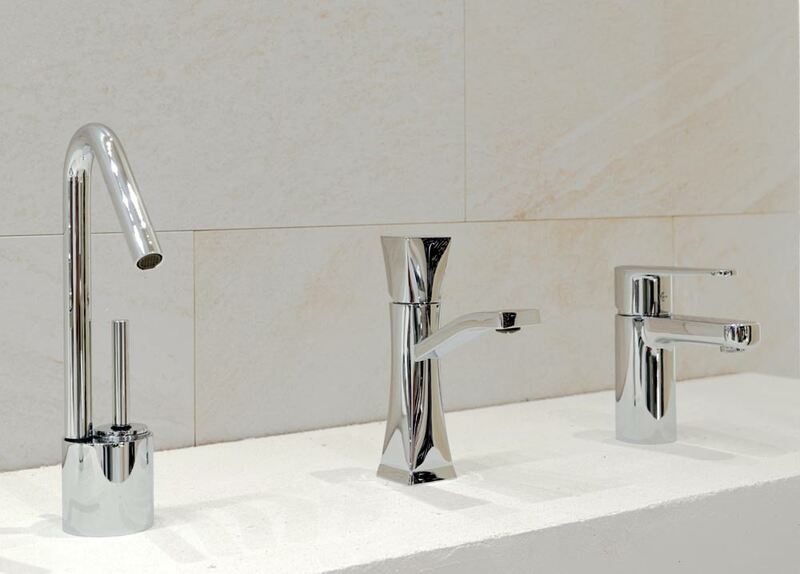 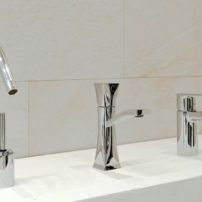 Personalize your bath with colored faucets. 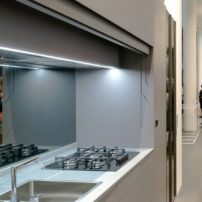 Who said a white kitchen had to be painted? 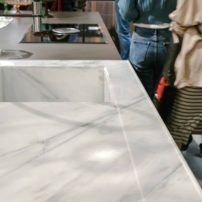 Countertops that slide to conceal cooktops and sinks when closed and create bar tops for seating when open, cabinet doors on vertical mechanical glides that hide a complete but compact kitchen away at the touch of a button, countertops that glide out from a base cabinet to create preparation and seating space in a small kitchen — and more. 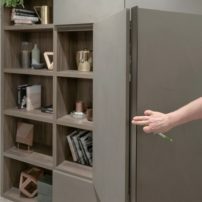 Hiding in plain sight is a brilliant solution for micro apartments and open-plan homes. 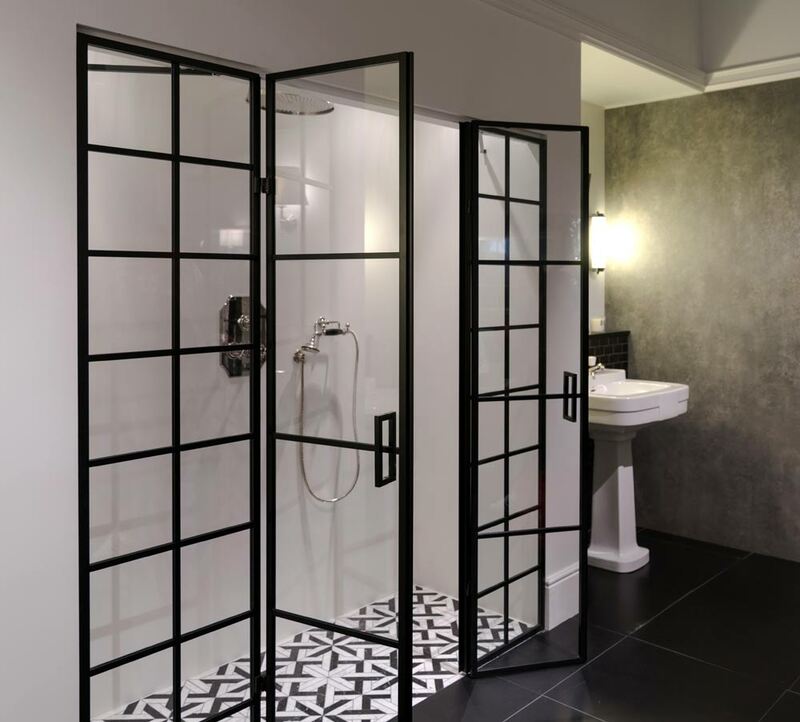 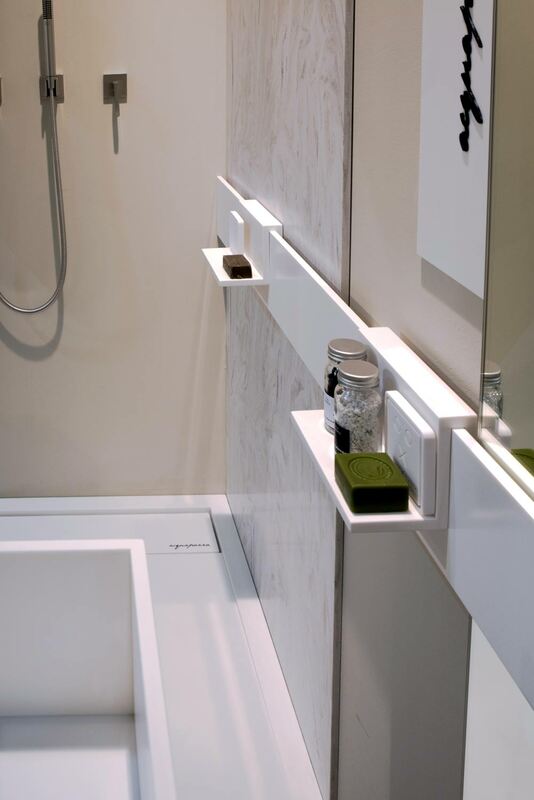 Combining open and concealed storage in the bath is trending. 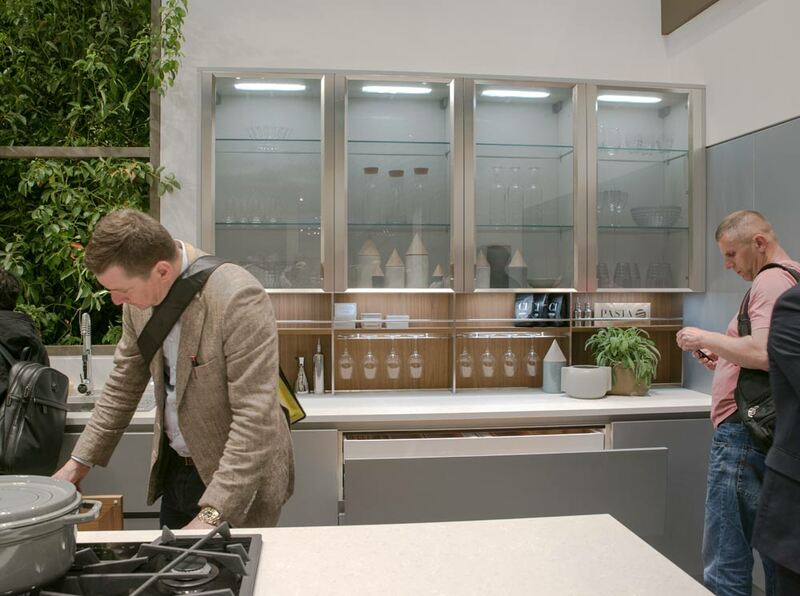 From edible foliage to hydrotherapy and more, incorporating edible and nonedible plants into interiors was a common design theme. 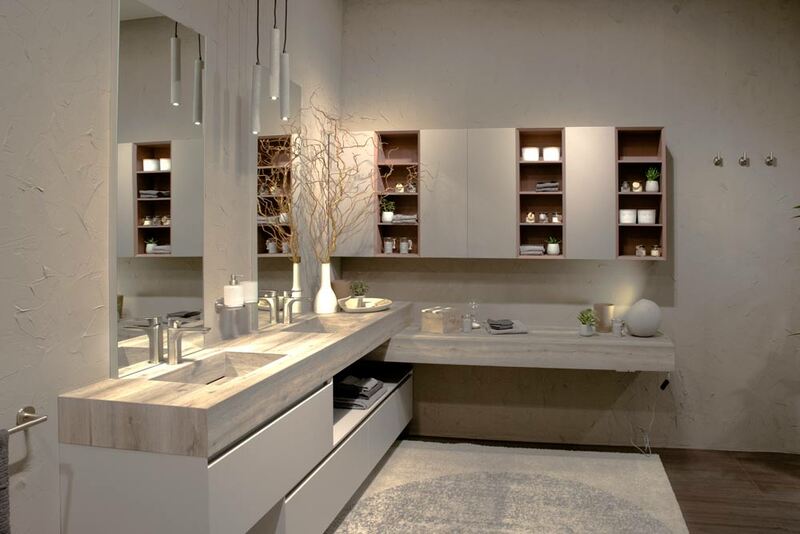 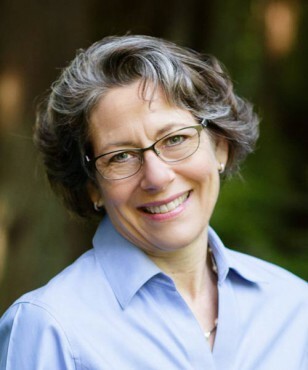 The impetus comes from the idea that spaces should facilitate both a nurturing and a healthful lifestyle. 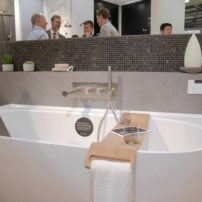 A one-wall freestanding bath tub makes installation a breeze and the tub accessory offers a convenient spot for both your book and wine glass for a totally restorative bathing experience. 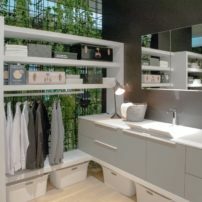 Open shelving was displayed for nearly every room in the home. 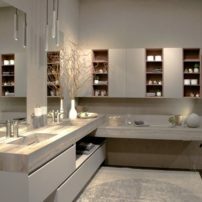 Open shelving in kitchens and bathrooms provides easy-access storage for decorative items such as platters, serving bowls, barware, towels and more. 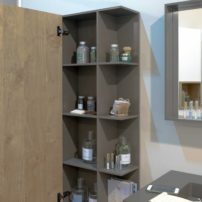 Open shelving in bedrooms and living rooms not only provides storage for decorative items and books but also functions as nonimposing room dividers. 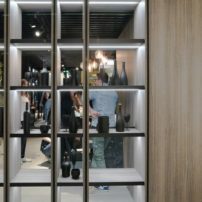 Most of the open shelving on display was flat-bar metal in a variety of finishes, with a very contemporary feel. 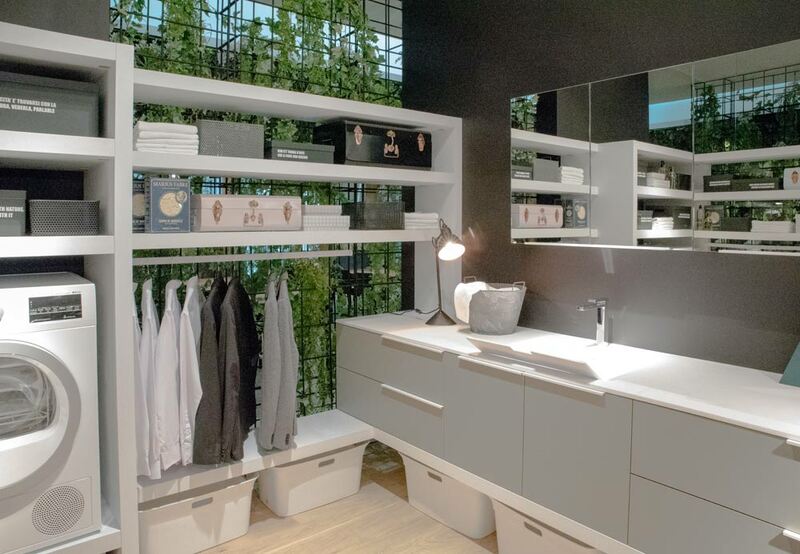 Some of these units were augmented with integrated lighting, including grow lights for herbs and microgreens in a kitchen setting. 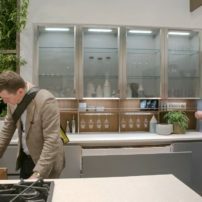 Flat-bar-metal open shelving provides decorative storage — add grow lights and you can grow herbs and microgreens. 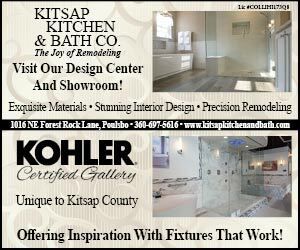 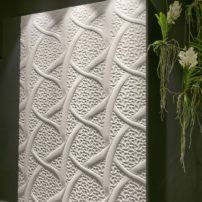 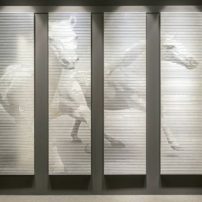 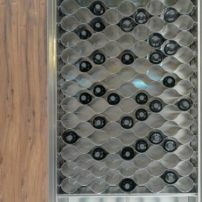 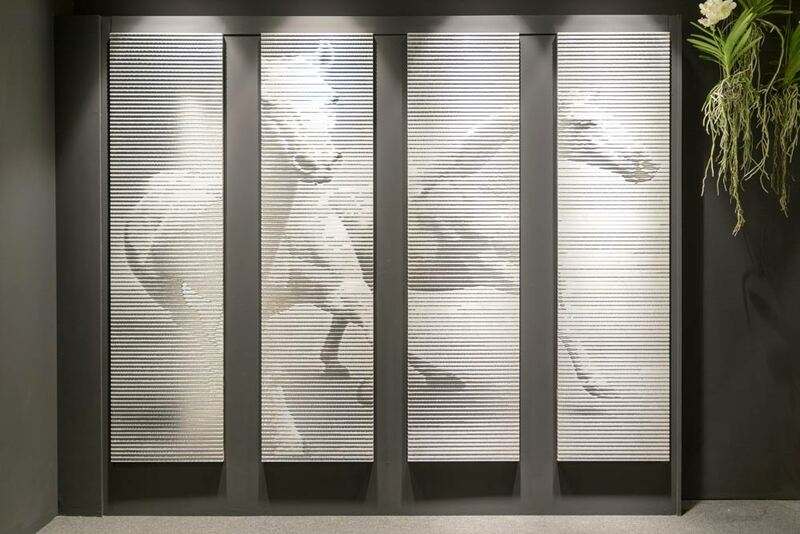 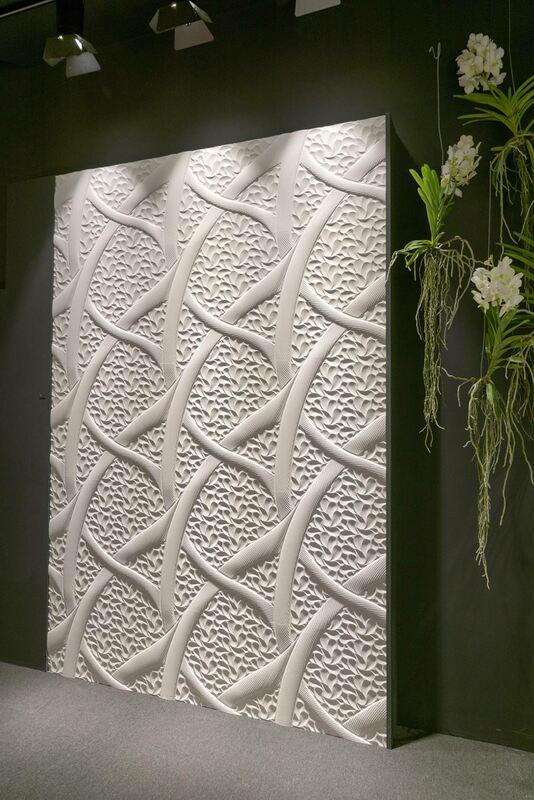 Tactile textures continue to trend in the kitchen and bath industry. 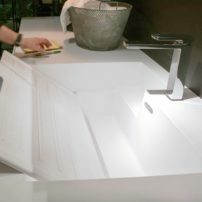 Curvy and smooth sinks, tubs, toilets and even faucets are paired with grainy wood cabinetry as well as floor and wall finishes. 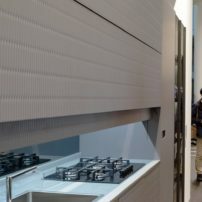 Backsplashes and tile wainscoting embrace textured and three-dimensional tile. 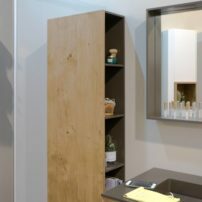 Cabinetry and countertop finishes ran the gamut of the material and color spectrum, with natural oak, elm and walnut cabinetry, and countertops from bright white to black, with the only common theme being a matte finish throughout. 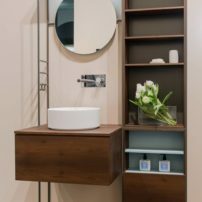 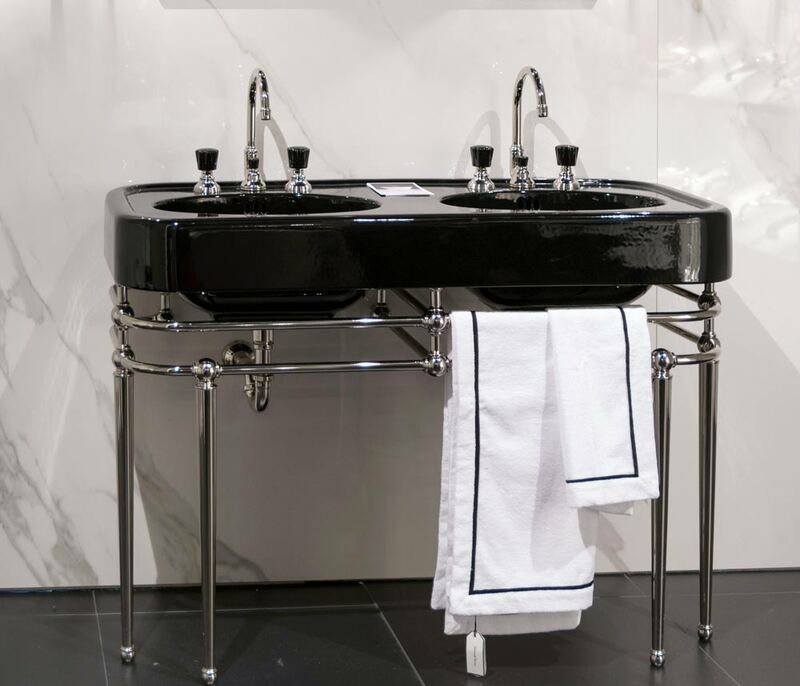 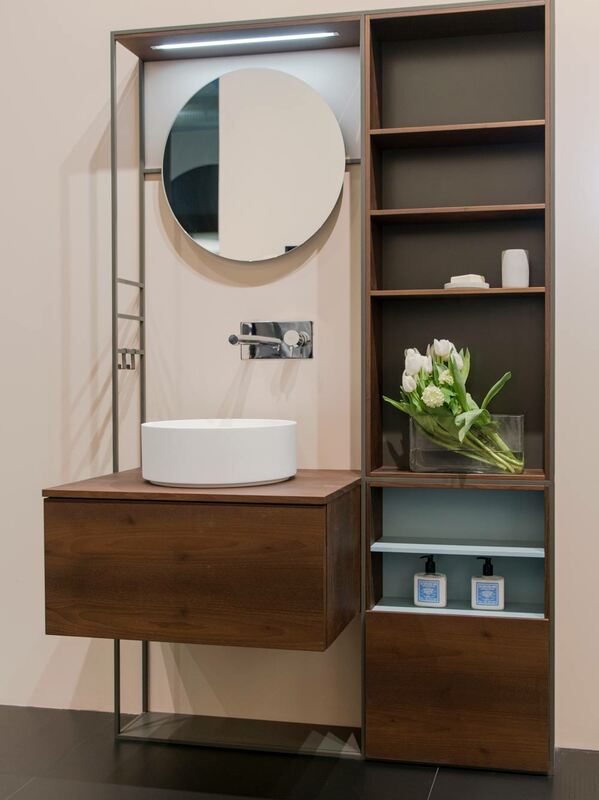 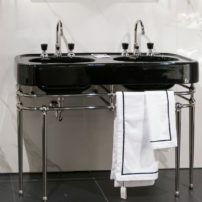 Wall-hung and console-style bathroom vanities, sinks and toilets continue to trend, giving the illusion of space in compact environments. 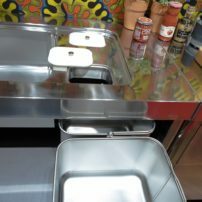 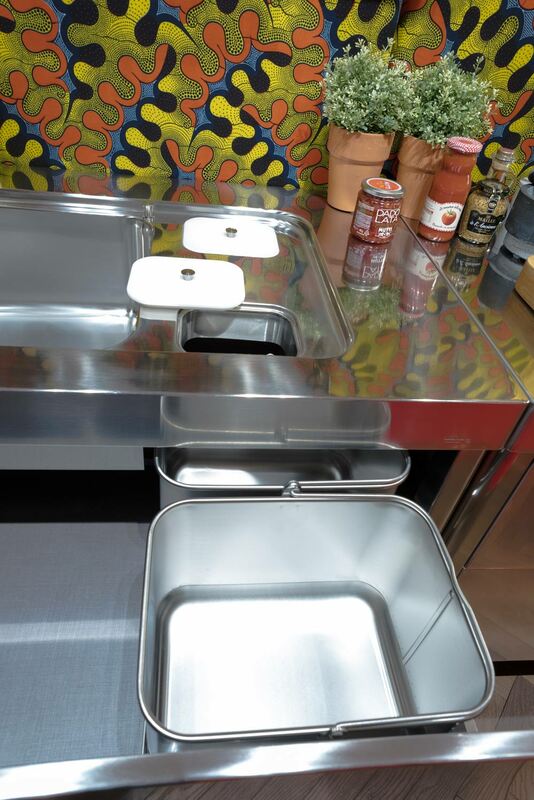 Movable countertops provide a much-needed prep area but can be tucked away for better flow when not in use. 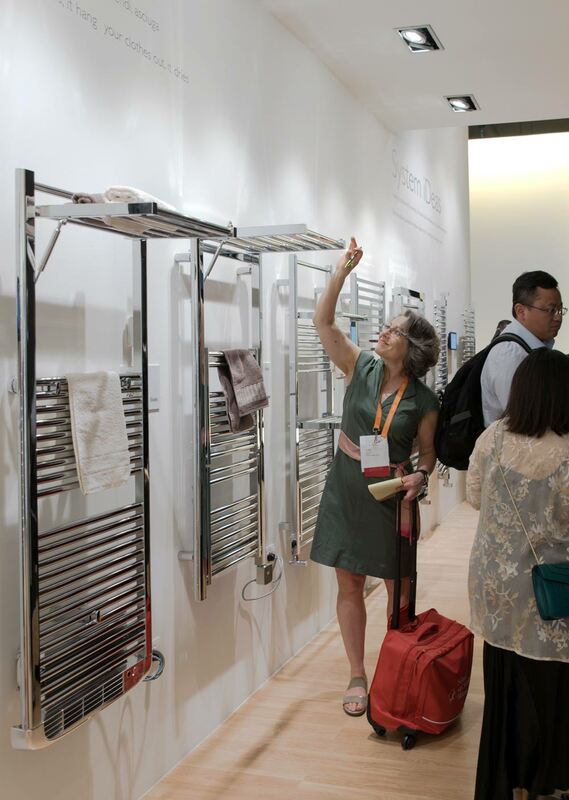 A towel warmer with a flip-up shelf provides flexible drying space for intimate apparel. 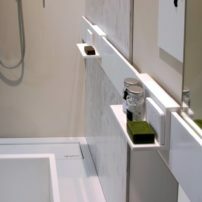 Keep your shower and bath area tidy with shelves that slide horizontally. 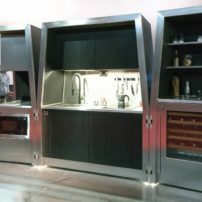 From luxurious outdoor furnishings that help keep the party host out of the kitchen and with the guests, to portable bars and one-wall kitchens, outdoor home entertaining is made easier with a comprehensive lineup of portable and weather-resistant outdoor cooking, serving and beverage equipment as well as furnishings. 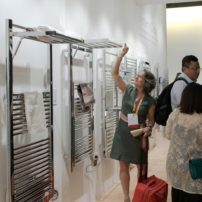 It will be interesting to see which of the above trends will make the trip across the pond in the near future. 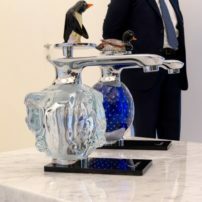 If only we had a crystal ball, but alas, only time will tell. 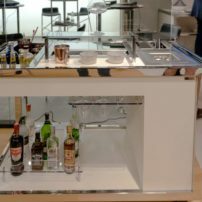 La Tavola has created a mixologist’s dream outdoor bar. 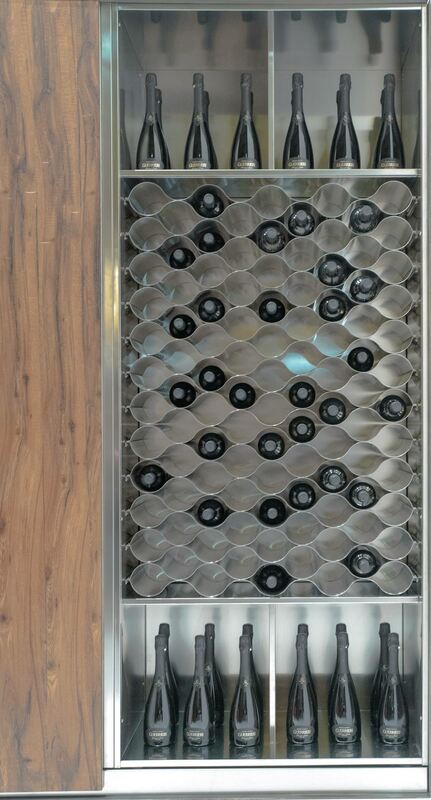 Turn your backsplash into convenience storage.